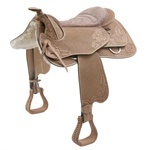 Our selection of Barefoot Western Treeless Saddles are sure to please even the most discriminating rider! Enjoy the comfort and fit of a treeless saddle with the workmanship of the Barefoot brand. Our treeless saddles have the exclusive VPS (Vertebrae Protection System) to keep the withers free from obstruction and give a close comfortable ride for you and your horse. Our line of treeless western saddles includes models suited for children and ponies, as well as pleasure and trail riding!